or a MAP of locations here. Photos taken by Roland Rhoades during a MOCA meeting May 2013, and in September 2018. 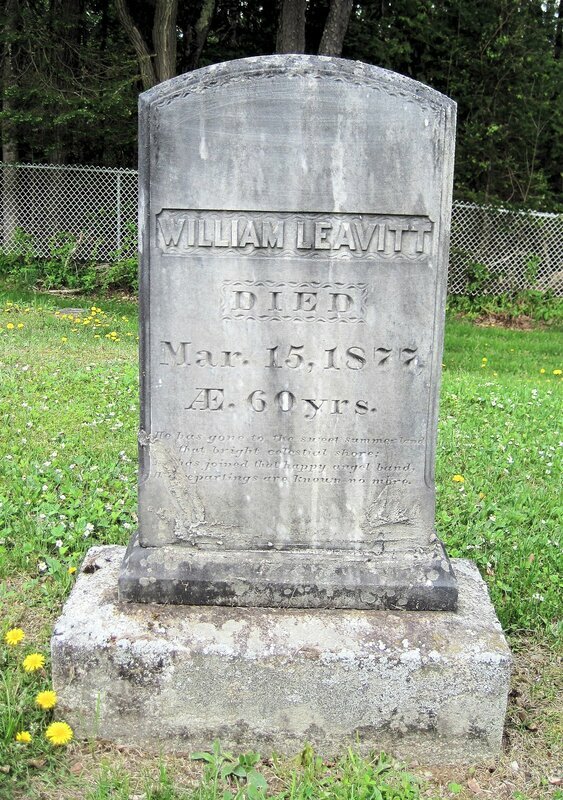 I took LEAVITT photos, plus my other family names, FRENCH, and the child Lillian SOULE in Spring Hill was the second wife of my g-grandfather Roland E Rhoades. 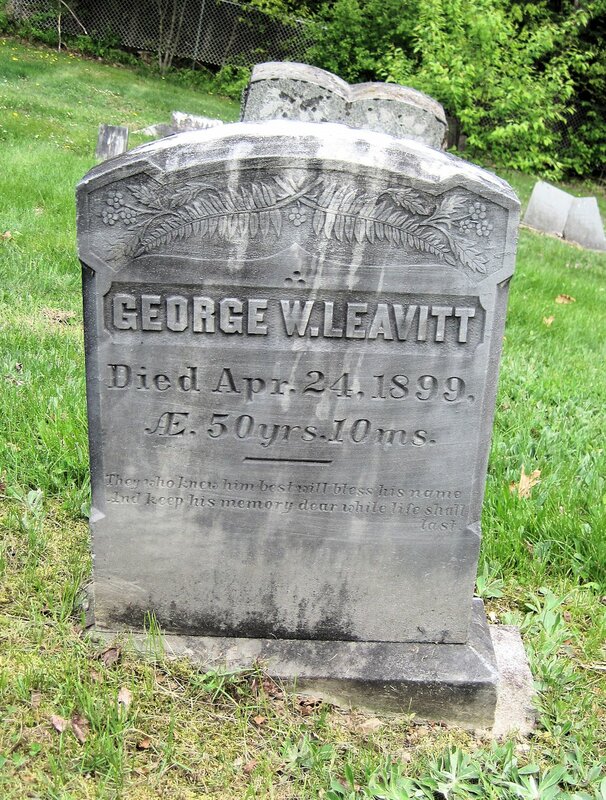 Additional info from the records and Vital Records compiled by the National Assn of Leavitt Families and the French Family Assn, records of both in my possession. 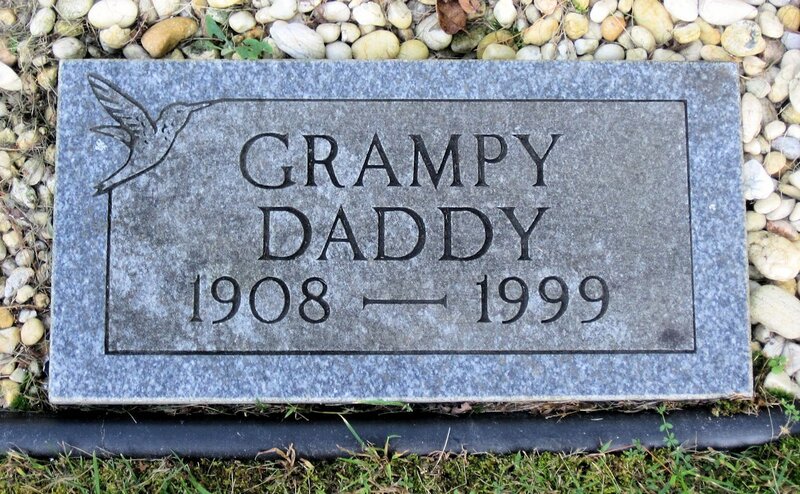 French family gravestones will remain on Roland's personal website. NOTE: MOST PHOTOS WILL ENLARGE OR PROVIDE A SLIDESHOW IF YOU CLICK ON THEM. PALMYRA VILLAGE CEMETERY, Warren Hill Road (Rt 151) almost on the corner of Rt 2. 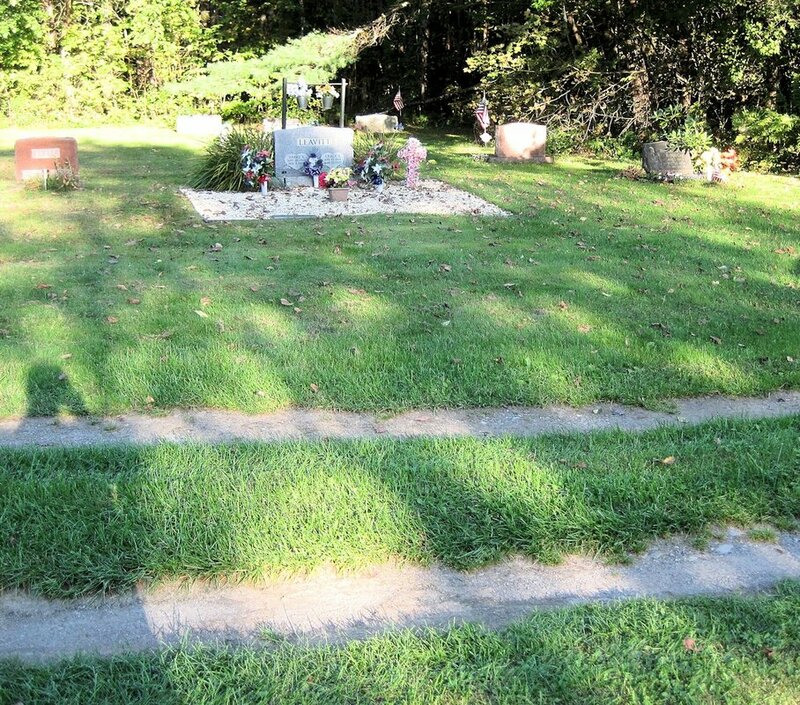 This stone is on the ​Left side of the cemetery which is Sect 2, Lot 35-36, on the left roadway in, at about the tree line separating the new section. 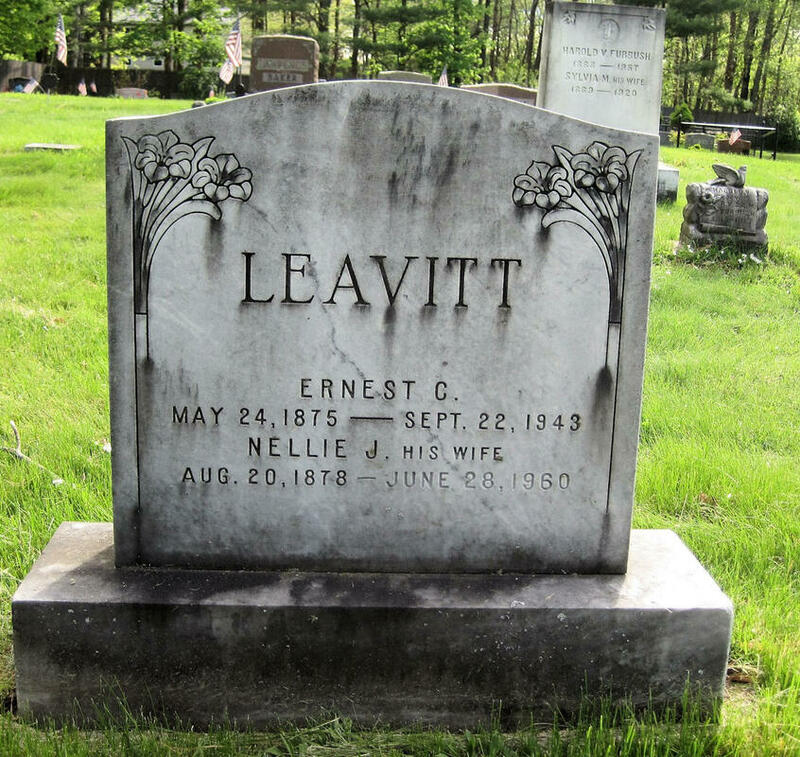 Ernest descends from the SAMUEL LEAVITT line. 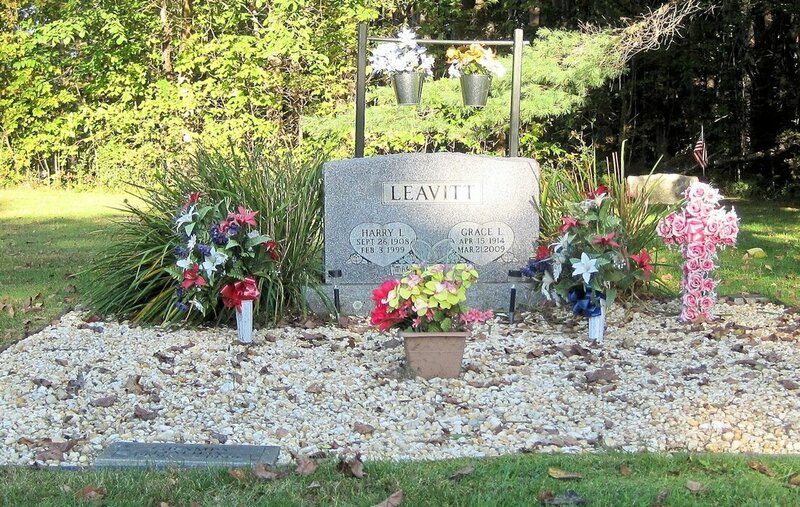 The rest of the Leavitt graves are in the rear of the cemetery. 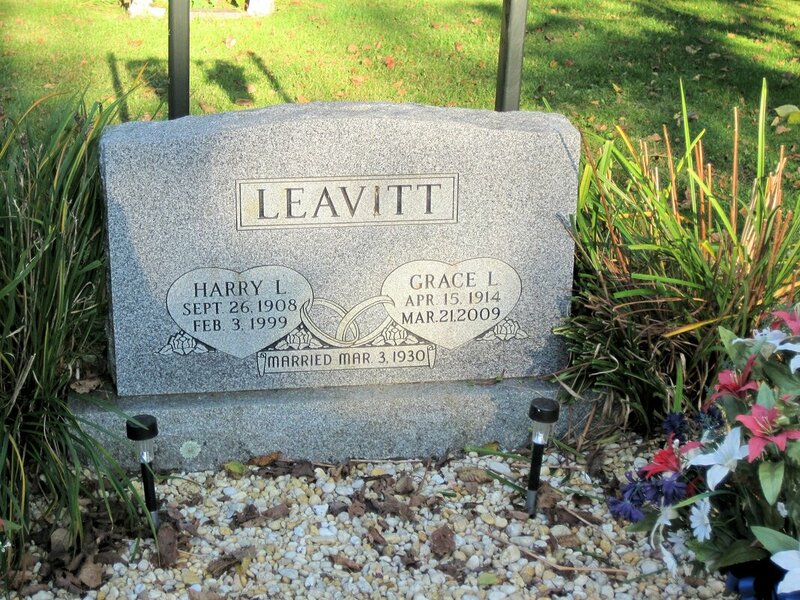 Harry descends from the DANIEL LEAVITT line. ABOVE: This Lot is in the new Sect 3 Lot 166, as you can see in this locational photo, in the back right corner of the new section. 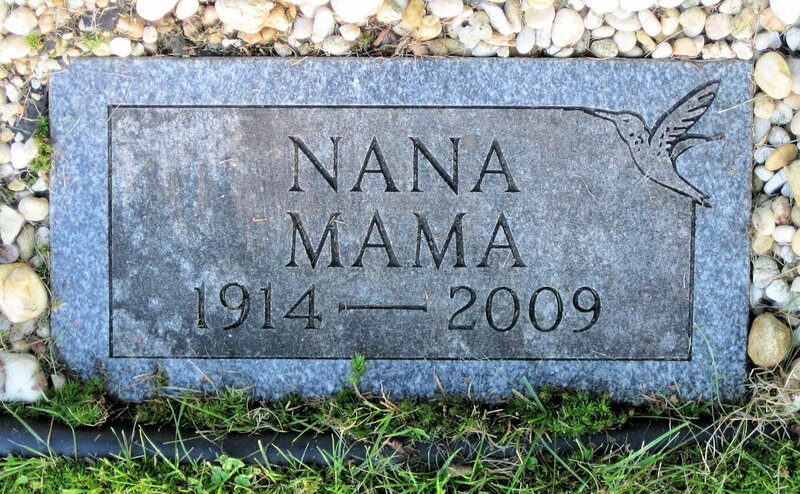 Grace L [DUNN], April 15, 1914 - March 21, 2009 [Brewer] Married March 3, 1930 in Dixmont. 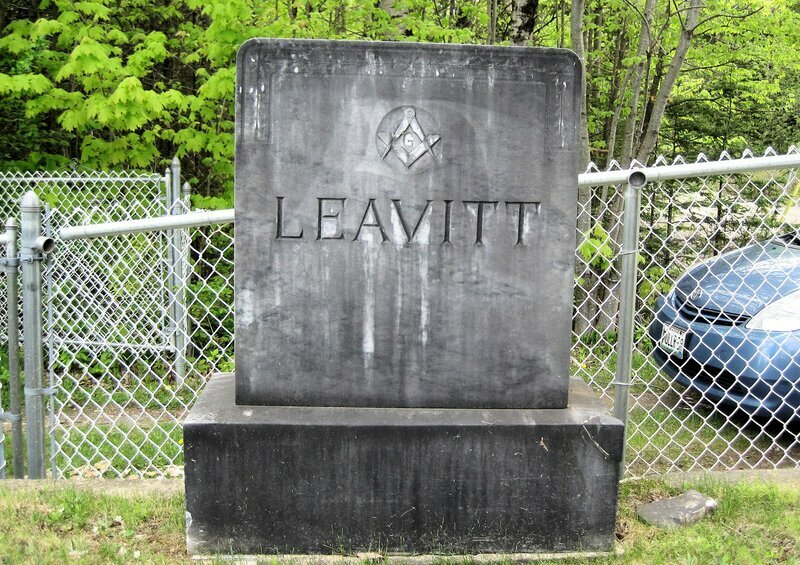 ​BELOW: Leavitt Lot from a distance. Grampy Harry and Nana Grace. 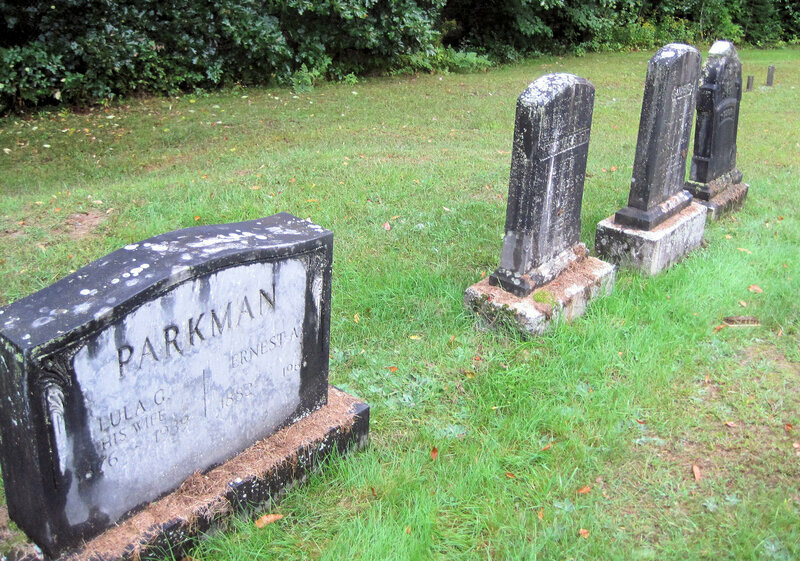 PALMYRA SPRING HILL CEMETERY, Spring Hill Road. 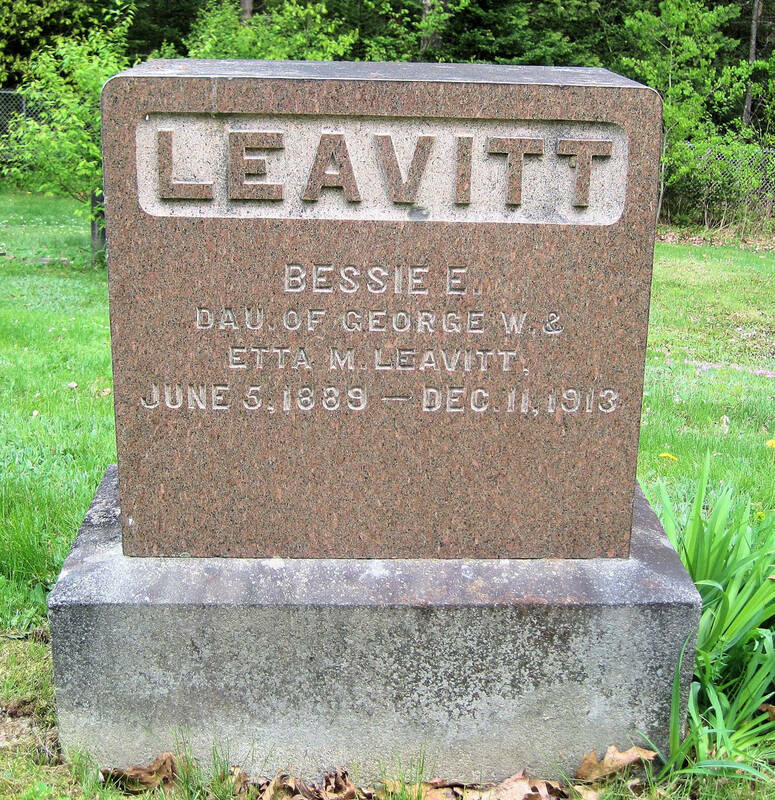 - all SAMUEL LEAVITT line. ​From Village Cem continue and stay straight onto St Albans Rd , travel 1.8 mi to Spring Hill Rd on your right. Cross Millers Corner and Weirs Road. 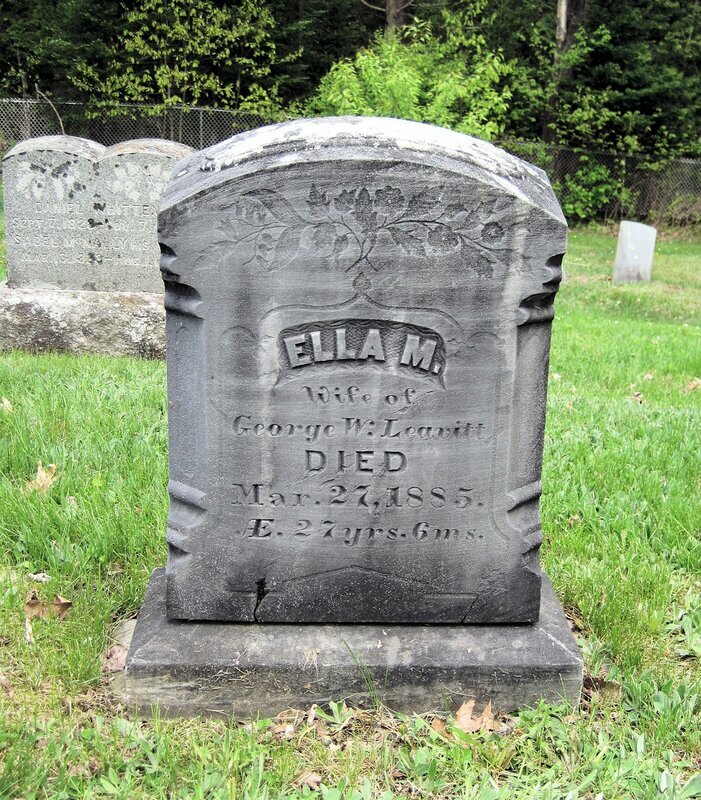 Cem will be on your right .9 mi from St Albans Rd. 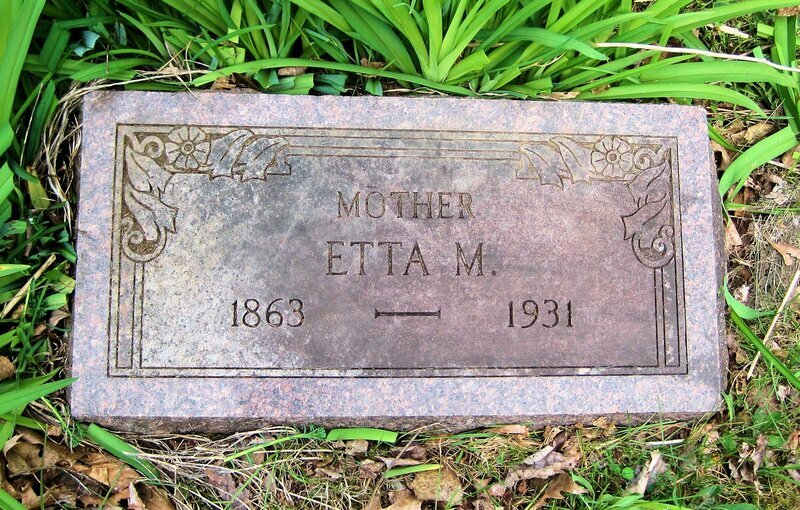 (formerly called Miller Cem by MOCA). I have no lot #s or sections from the town, so am labeling the sections #1 at the entrance, then #2, 3 and 4. 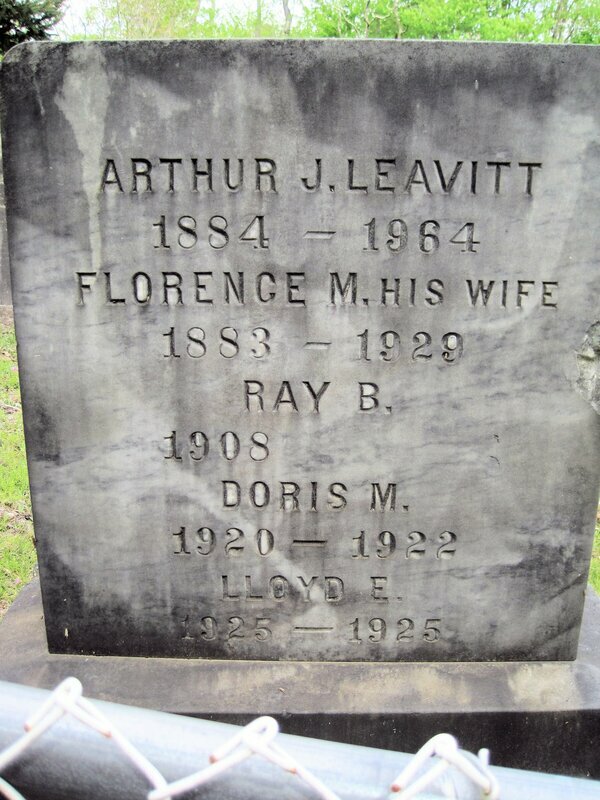 Ray Bertram 1908-[21 Feb 1908 P. - 22 Jan 1994 Augusta]; Doris M 7 Aug 1920 - 16 Jan 1922 Palmyra; Lloyd E 4 Jan - 27 Jan 1925 Palmyra. And, ​Flipside, at entrance. Freemason. 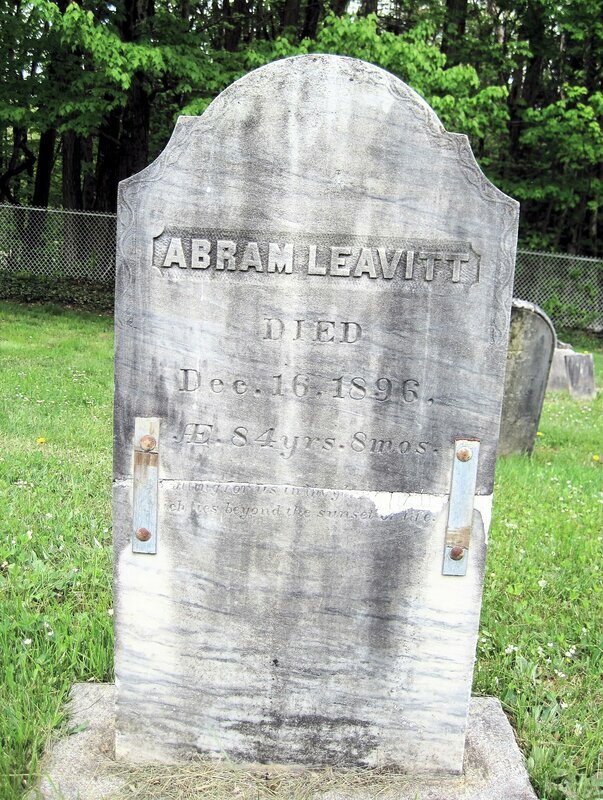 Section #2: TOP ROW - Abram S was the son of Jonathan Leavitt & Sarah Stockbridge, born Stratham NH. 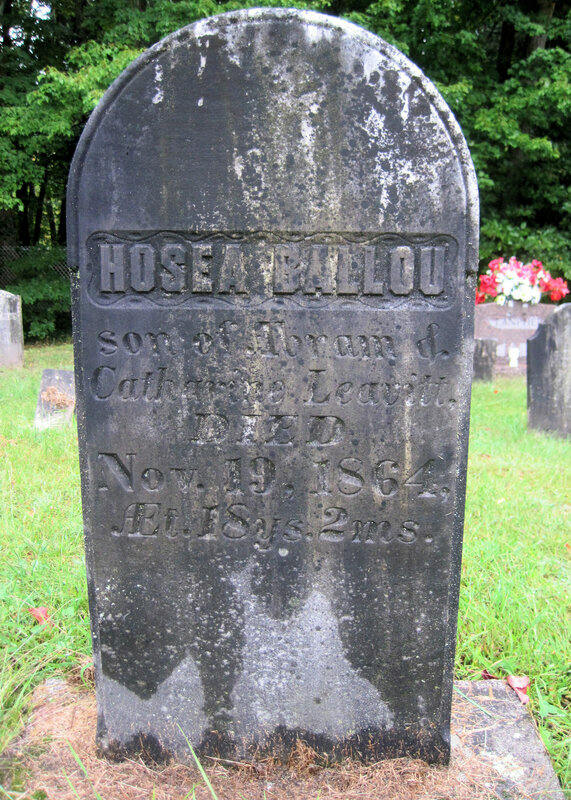 The family belonged to the Universalist Church, obvious since they named a son Hosea Ballou after the famous Universalist Minister, Theologian, and Writer. see section 4 for Abram's 2nd wife Cynthia. 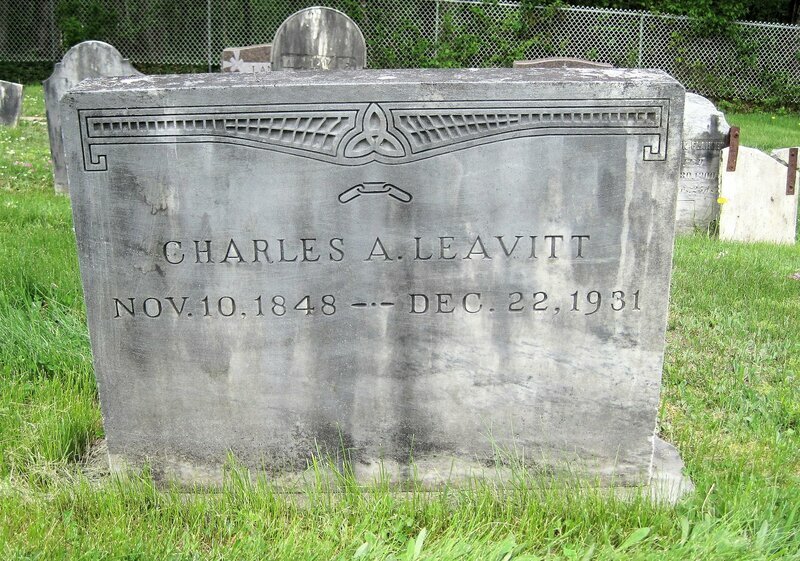 Abram LEAVITT died Dec 16, 1896 AE 84 yrs. 8 mos. Stone broken through inscription. "He is waiting for us until.... Such ties beyond the sunset of life." 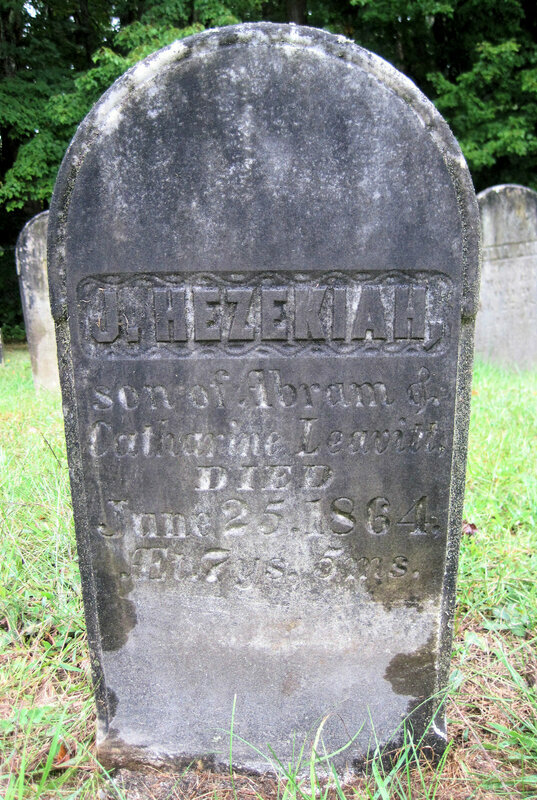 ​ J. Hezekiah LEAVITT, son of Abram & Catharine, died June 25, 1864, AEt 7ys 5ms. 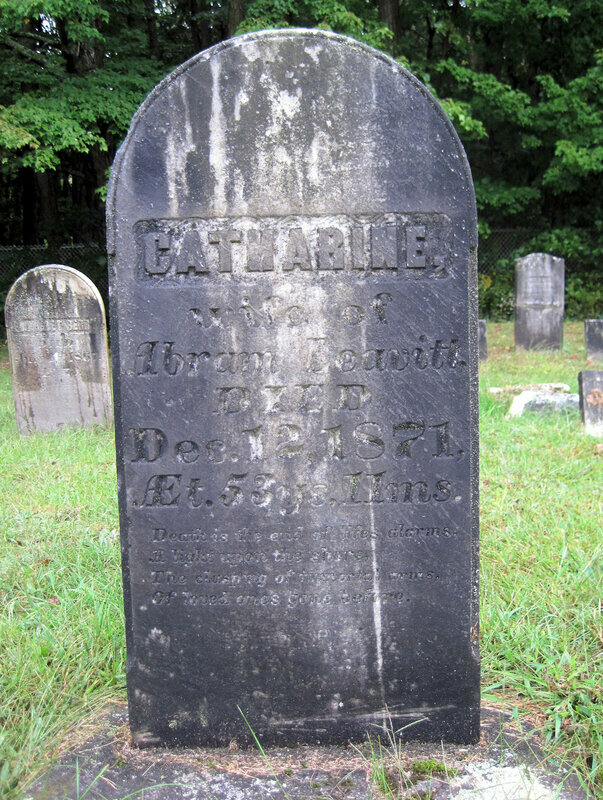 Hosea Ballou LEAVITT, son of Abram & Catharine, died Nov 19, 1864, AEt 18ys 2ms. 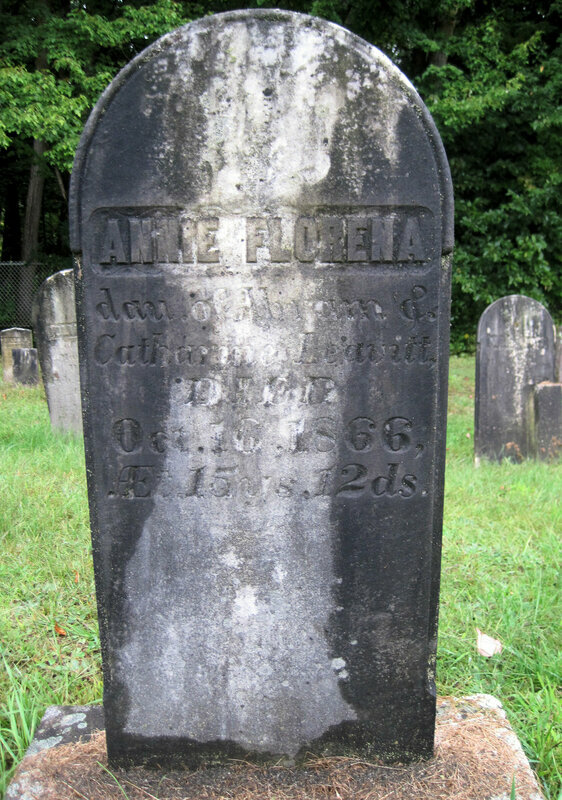 Annie Florena LEAVITT, dau of Abram & Catharine, died Oct 16, 1866, AEt 15ys 12ds. 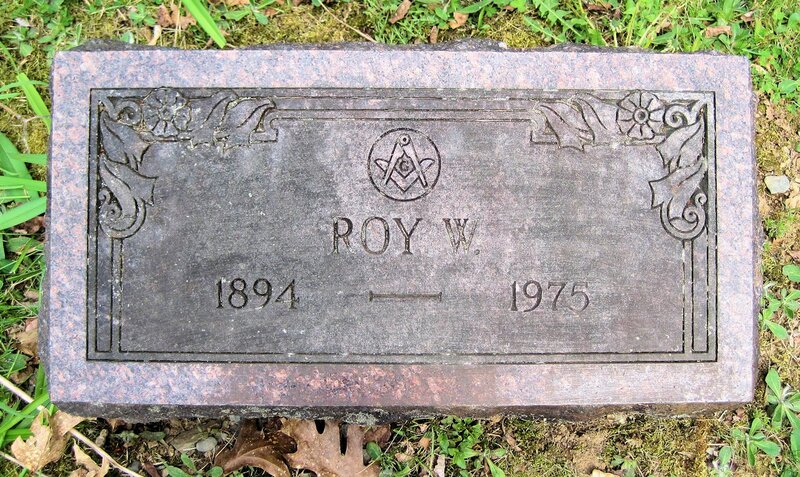 Section 4: These 2 stones below are together. 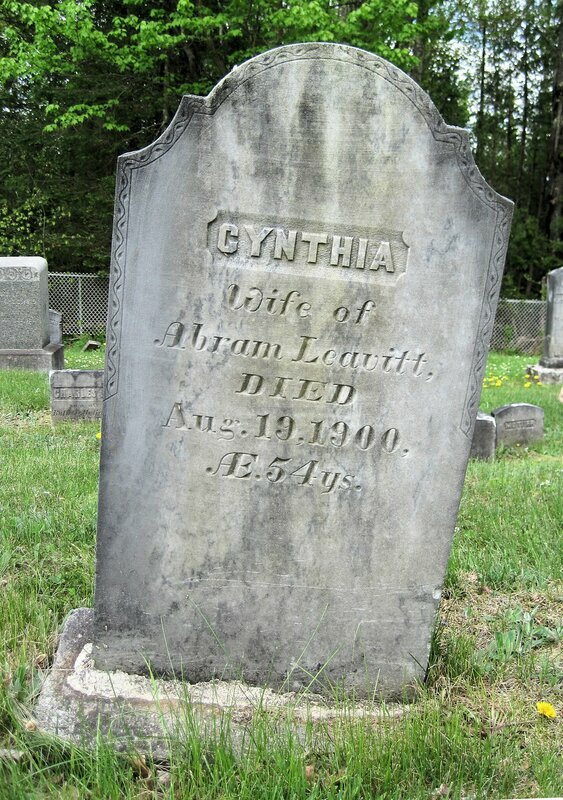 Cynthia [SHAW, 2nd] wife of Abram LEAVITT, died Aug 19, 1900, AE 54ys. 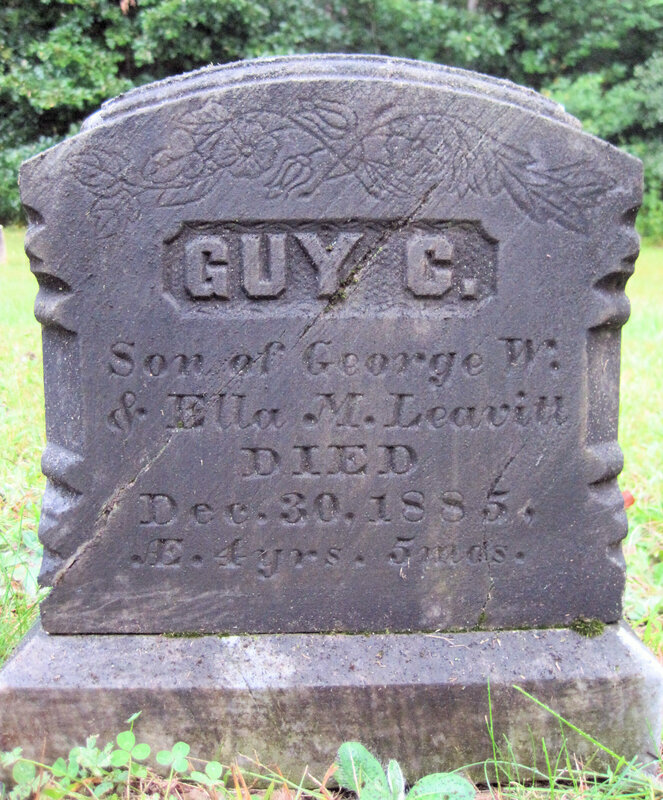 ​ Ella M [CRAWFORD], wife of George W LEAVITT, died Mar 27, 1885, AE 27 yrs 6 ms.
​ Guy C LEAVITT, son of George W & Ella M, died Dec 30, 1885, AE 4 yrs 5 mos. 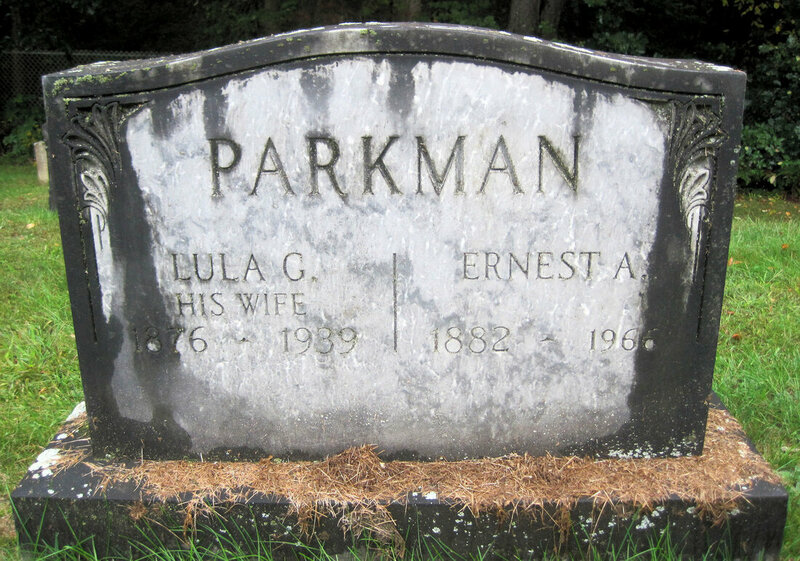 ​Below: Parkman connection, parents of Etta May above: Ernest A Parkman 1882-1966; Lula G his wife 1876-1939. 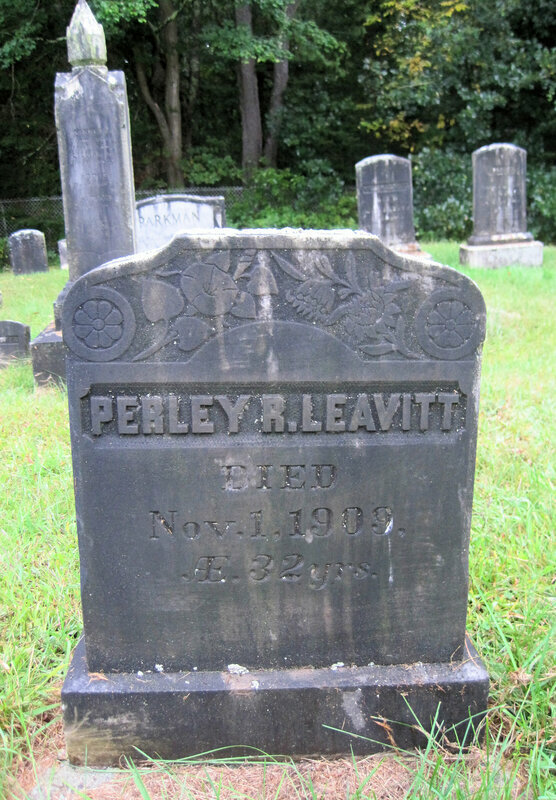 3 Leavitt stones next to Parkman: these 3 stones together, almost far back corner, 2 rows below Cynthia. 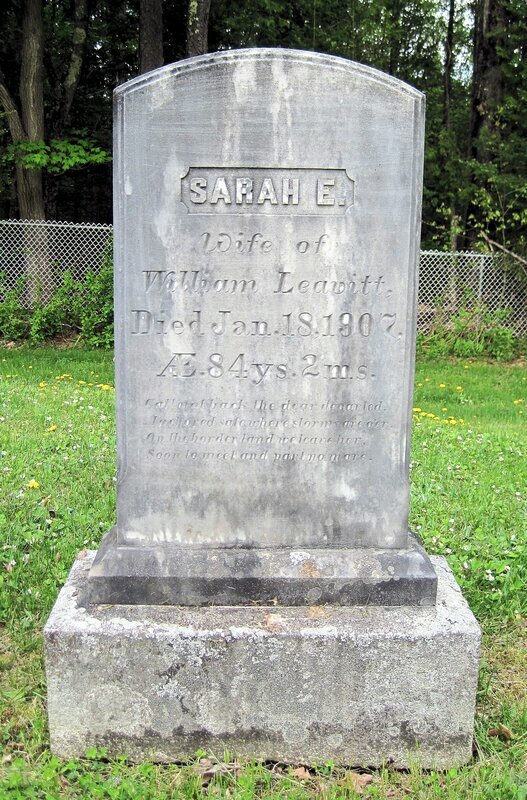 Sarah E [PILLSBURY], wife of William LEAVITT, died Jan 18, 1907, AE 84 ys 2 ms. "Call not back the dear departed, Anchored safe where storms are o'er. On the border land we leave her, Soon to meet and part no more." 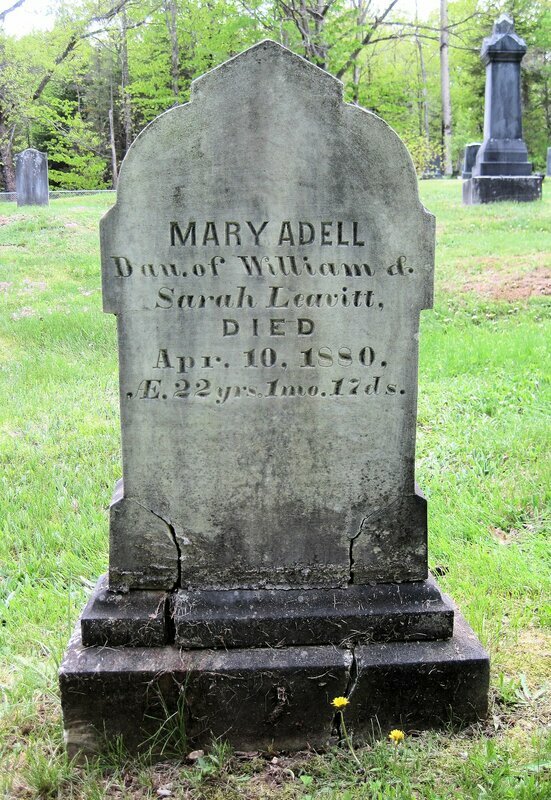 Mary Adell LEAVITT, dau of William & Sarah, died Apr 10, 1880, AE 22 yrs 1 mo 17 ds. 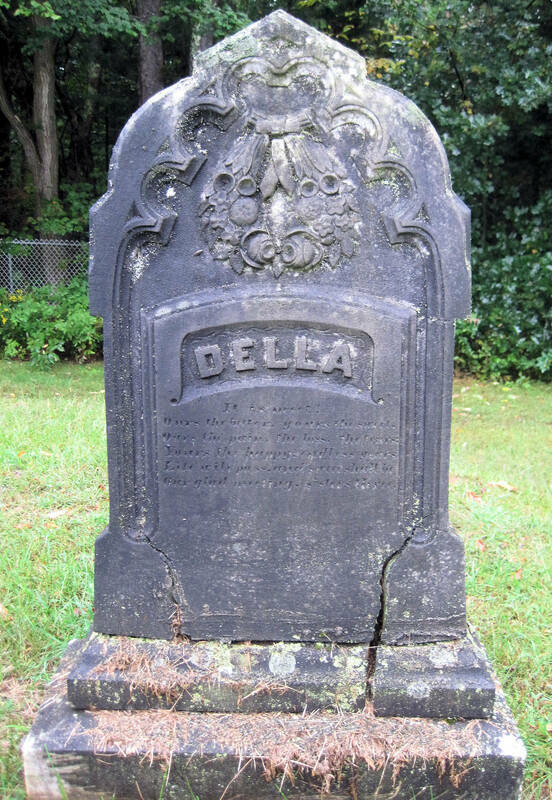 Flipside: ​DELLA. "It is meet! Ours the bitter, yours the sweet, Ours the pain, the loss, the tears; Yours the happy, endless years, Life will pass, and sweet shall be, Our glad meeting, sisters three."